Students dig into math using pumpkins at O’Hara School in Eugene. 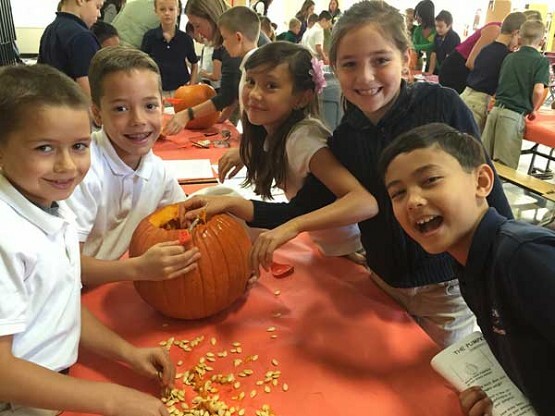 EUGENE — Late last month, led by teachers Gavin McKinnon and Emmy Pusateri, O’Hara School third graders held their annual pumpkin math morning. Students, along with the help of parent volunteers, use pumpkins and pumpkin seeds to sharpen their math and scientific method skills. Students, divided into 10 groups each with their own pumpkin, count seeds, hypothesize as to whether the pumpkins will sink or float, measure circumference, determine the difference in the smallest and largest pumpkin, estimate other objects that might weigh the same as their pumpkin, make graphs to include data from all 10 pumpkins and perform other calculations with measurements taken. When all of the math and science work is completed, students carve a face in their pumpkin. Pumpkin math has been an annual tradition at O’Hara since 2001.